It has always been a great sadness to Henry Quick's family that he died so tragically, so far from home, and that none of his family had ever managed to visit his grave. For one thing, no-one had been able to establish exactly where it was. 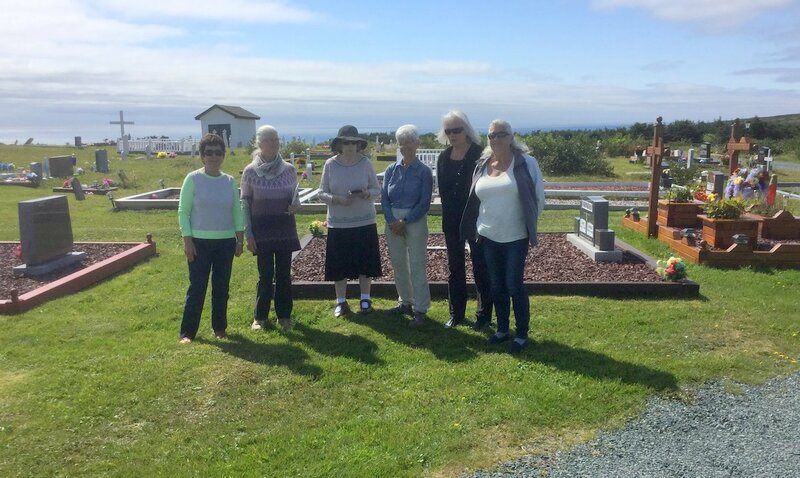 At last, in September 2018, four of his great great grandchildren - four sisters - met together in Newfoundland to continue the search. With a great deal of help from local inhabitants we were able to find his whereabouts and pay our respects. The family had always believed he was buried at Holyrood cemetery. One friend, travelling to St John's several years ago, was asked to see if they could find the grave, but they found no clues at Holyrood. And why would he be buried so near to St John's so far away from the scene of the disaster? To add to the confusion was the fact that there is also a Gull Island in Conception Bay to the north. But then my husband found the vital piece of missing information: until 1910 St Vincent's, right by Gull Island Point and Peter's River in St Mary's Bay - had been known as Holyrood. and we found the cemetery at St Vincents, had a good search but did not find the headstone. Bill said it had likely fallen over and got submerged, given the texture of the soil there. ... I am in receipt of yours of the 4th having reference to the past great sorrow which has befallen you in the loss of your respected Father. We had prepared and ready on the opening of navigation in the Spring the Memorial Stone which previously was referred to - and it was taken charge of by Mr Wm St Croix a respectable person, some time doing business with us and from this circumstance your late Father was known to him. But we couldn't be absolutely certain this really was the right cemetery. I know it looked very very likely but I couldn't help wanting actual proof. I had phoned the place where its records are kept, but was told there had been a fire since 1881 and nothing had survived for that date. Due to stupidity I was unable to hire a car (no credit card!) to return to the bottom of The Irish Loop to investigate further at that time but loved St John's, the archives, the view of the harbour from The Rooms, etc, etc, and vowed to make a return journey. In 2017 my sister Pam and her husband Robert took their campervan to Newfoundland and had a more intense search but likewise found nothing. 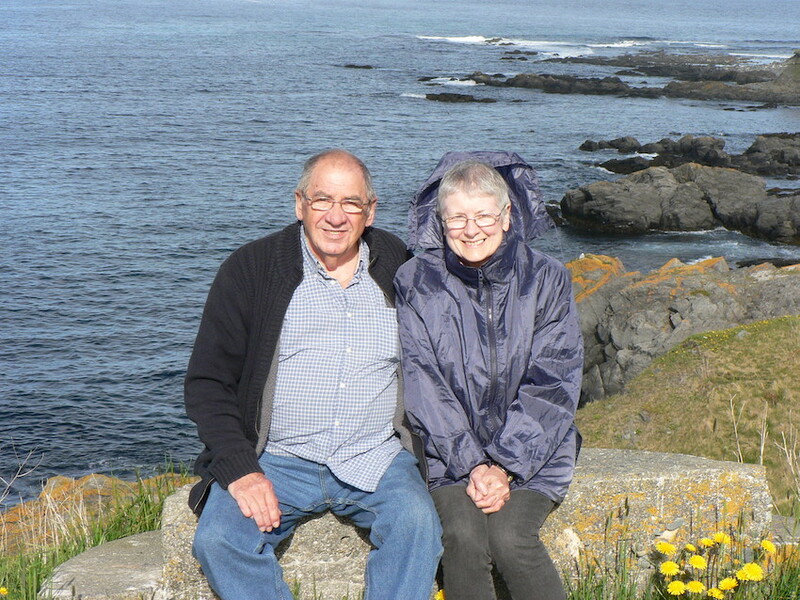 But she and husband Robert started chatting with Mary and Shirley Fleming at the Holyrood Pond Interpretation Centre cafe, near to where Peter's River flows into St Mary's Bay, and they seemed very interested in the story. And in 2018 it all happened. 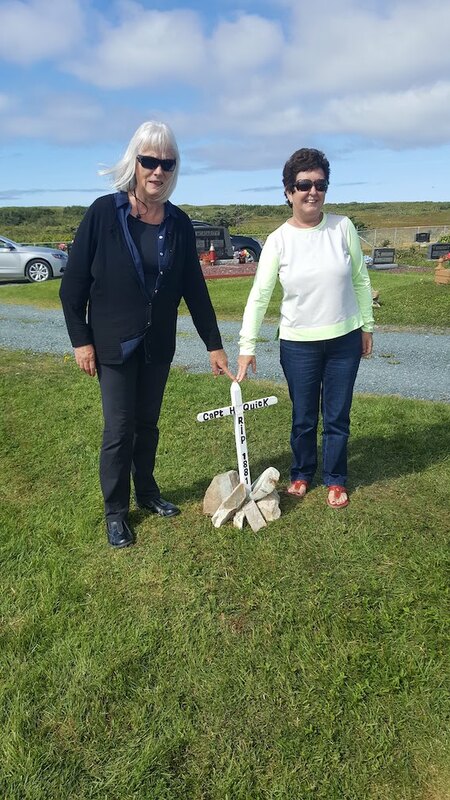 When the four of us returned to the Interpretation Centre Mary immediately made a phone call to Bernadette Stamp, whose late husband Patrick was a descendant of Thomas Stamp, one of the two guys who found the remains washed up in Gull Island Cove in 1881 and had given the crew a respectful burial. Bernadette confirmed that the story of the wreck and of Captain Quick was a story which had been handed down in the family ever since. This was the best proof anyone could wish for. Living memory to me is better than written records. We certainly did have the right cemetery. 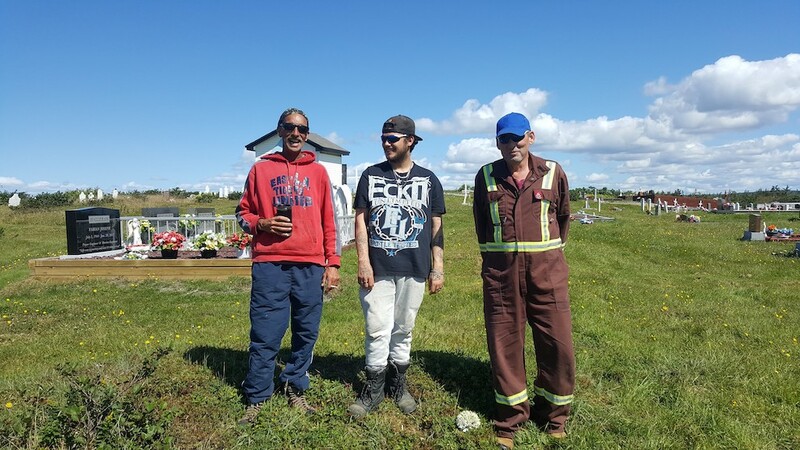 She said also that the crew had initially been buried outside the perimeter of the cemetery but as the fence had been moved outwards twice in the last fifty years to make the grounds bigger, they were now inside the fence but would not be very far from it. The cemetery was undergoing a thorough renovation when we went, and was beginning to look really lovely. Several old previously fallen and obscured headstones had been discovered and made visible but ours was not among them. But it was lovely just being able to be sure our great great grandfather really was there. Then on our very last trip down there, before my sisters returned to Alberta and British Columbia, and me to England, we had arranged to meet Betty Stamp. When we got there, we heard about a coincidence that had happened. 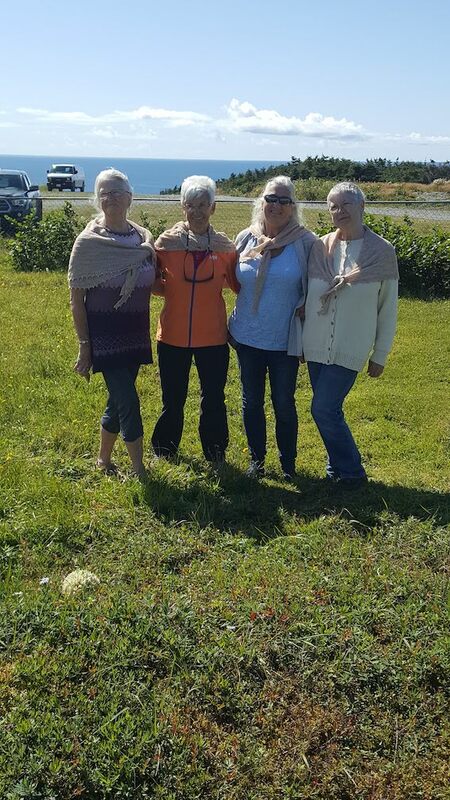 Betty had been visiting a local shop and had run into two cousins, Rose and Phyllis who were descendants of the St Croix family. William St Croix had been a friend of our G G grandfather and had taken charge of the headstone. Rose and Phyllis no longer live in Newfoundland, but in two different places from each other, and neither had known the other was going to be in Newfoundland while they were visiting there, and neither had known they would be meeting up in the shop that day. So the chance meeting of these three people was a triple coincidence. and increasingly becoming covered in earth and dust. They'd brush the bits off the gravestone and read the inscription. They knew just where this used to happen. And that's how we discovered the spot. We all went up to see it, and sisters and I were presented with a wooden marker by the committee for the site renovations, and the two St Croix cousins agreed just where it should be put. Mrs Gibbons arrived to help as well, which was perfect, as now we had descendants from Henry Quick, descendants from William St Croix, a member of Thomas Stamp's family and now one from Patrick Gibbons', the other person who discovered the remains on the beach back in the day.